This week we will continue with situations where government…politics…continues to try to change the ‘face’ of today’s society. These changes directly try to ‘stare down’ God’s Word and His intentions for mankind. 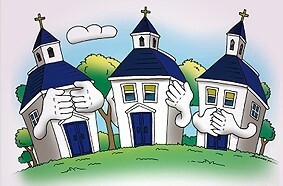 If the churches don’t take up the ‘gauntlet’ who will? Contrary to the beliefs of many that the ‘game’ can be won from the bleachers, the secular world team is in full attendance on the field and only a few of the church ‘players’ have shown up. Unfortunately the game got underway a long time ago. It’s time to clear out the bleachers. If the majority of the world is sinners then we know who the politicians will cater to. Let’s take a look at the undercover ways satan is trying to conquer the world. Not that I do not have anything against Tennessee but we will start off with educators in the Volunteer State where there was concern that students might be offended…get out the towels and coloring books…by the usage of traditional pronouns like ‘she’, ‘he’, ‘him’, and ‘hers’. This comes from the University of Tennessee…Knoxville’s Office of Diversity and Inclusion. Per the university’s website “with the new semester beginning and an influx of new students on campus, it is important to participate in making our campus welcoming and inclusive for all. One way to do that is to use a student’s chosen name and their correct pronouns.” [Donna Braquet,”Inclusive Practice: Pronoun Usage”, University of Tennessee, August 26, 2015]. Donna Braquet, director of the university’s Pride Center, suggested using a variety of gender-neutral pronouns instead of the traditional. There are dozens she declared. [Ibid]. Here are just a few of the proposed new pronouns…ze, hir, hirs, xe, xem, and xyr. Professors were instructed that instead of calling roll, ask everyone to provide their name and pronouns. This was to ensure that the professor was not singling out transgender or ‘non-binary’ students (new word). [Ibid]. ‘Big Bob’s’ birth certificate says ‘Big Bob’ is a male but if ‘Big Bob’ identifies as a lady who wants to be called ‘Bobette’ according to the procedures outlined at the diversity office then the professor is obliged to call ‘Big Bob’, ‘Bobette’ or whatever makes ‘Big Bob’ feel more included. We were being called names while I was a plebe at the Naval Academy and I had no idea it was because USNA was so far ahead of the times…I don’t think so. We didn’t get a choice of names to be called. The diversity director went on to say,”We should not assume someone’s gender by their appearance nor by what is listed on a roster or in the student information system.” [Ibid]. Part of the effort was to eliminate or reduce the use of the terms sir or ma’am. Politeness called for asking each one what pronoun they wanted to be known by. I wish that this was a ‘fairy tale’ but it’s not. Fortunately not everyone was on board with the gender-neutral pronouns. Lots of folks in Big Orange Country turned blood red when this policy was made public. It was even too much for a politician. Tennessee state senator Mae Beavers commented,”It’s the most ridiculous thing I’ve ever heard. If you must interview a student before you greet the student, that’s not acceptable…that’s just absurd.” [Mae Beavers in communication with Todd Starnes, August 2015]. Beavers represents a very conservative district and she said her constituents are enraged at how their tax money is being spent by the university. She further states,”This isn’t inclusion, this is the radical transformation of our lives and language.” [Julie West in communication with Todd Starnes, August 2015]. Julie has two children who attend UT. This is politics trying to negate God’s design for man and woman. Taxpayers became enraged. Pastors spoke from their pulpits…there are those who are willing to separate ‘right’ from ‘wrong’…and urged their parishioners to cal their lawmakers…politicians. They did just that. Nashville was inundated with hundreds of phone calls. ‘Strangely’ the university backed down from its policy ‘recommendations’. [University of Tennessee Backing Away From Gender-Neutral Pronoun Suggestion”, Media General Communications Holdings, LLC, September 5, 2015]. When Christian patriots stand up and speak out, they can have an impact on our society. Here, church and some politicians worked together to correct a secular proposal gone wild. Next we will go to Ocean City, Maryland…this stuff is taking place all over the United States. Captain Butch Arbin, a forty year veteran of the beach patrol faced the wrath of City Hall…politicians…and the militant LGBTQ activists over his handling of a bathroom controversy involving male and female lifeguards. [Fenit Nirappil,”Careless Email Brings the Nation’s Bathroom Wars to Ocean City, MD.”, Washington Post, June 15, 2016]. Female lifeguards had complained…and rightfully so…that male lifeguards were using their dressing rooms. The male lifeguards were not transgender. They were using the ladies room out of convenience, seeing as there were more male than female lifeguards. [Ibid]. When I was growing up I could have never conceived such a thought…well maybe just a little. So Captain Arbin fired off an email to set things straight…”WE are NOT Target. USE the locker room that corresponds to your DNA. If you’re NOT SURE go to Target.” [Ibid]. The LGBTQ activists did not share his sense of humor. They leaked the captain’s email to the news media and as you might expect, they ran with it. It was considered nothing short of making fun of transgender people and that was considered unacceptable for a city employee, so stated FreeState Legal Executive Director to the Washington Post. [Ibid]. It was further suggested that the email might result in physical harm to the LGBTQ community. (Here we go again with ‘might’). Captain Arbin said his email had nothing to do with transgender people. He was only looking out for the women of the patrol who choose to use a gender specific facility. [Ibid]. He told the Baltimore Sun that the guys were leaving the toilet seats up. Further he stated that he didn’t care about being politically correct…that’s one of the problems in the country right now. [Jessica Anderson,”Ocean City Beach Patrol Captain Draws Fire With Email on Locker Room Use”, Baltimore Sun. June 14, 2016]. The LGBTQ activists didn’t care that he was looking out for the female lifeguards. It was ‘political waterboard’ time. Captain Arbin issued a public apology but City Hall still threw him under the ‘cabana’ declaring his actions “completely in appropriate”. [Fenit, Ibid]. Ocean City Today, however, had a different view of the situation.They suggested he should tell his critics to pound sand. They were critical of a policy about having “to take special care that we don’t put a toe over the line of hurting someone’s feelings.” [OC Today,”Insensitivity and Loss of Perspective”, June 17, 2016]. This brings to mind, though, about many of our ministers who are ‘afraid’ of offending someone in their Sunday message. If the message is based on the Word of God and someone is offended maybe that is just what they needed. When we are fearful of attacking a problem because we don’t want to hurt someone, then our effectiveness as a problem solver is nil. Attacking a symptom and not the problem will solve nothing. Captain Arbin was concerned with the problem and the City…politicians…with the symptom. The City’s response solved nothing. Next week we will look at a couple of situations where girls…our daughters…are being subjected to a full attack by the LGBTQ community. How did our nation become so confused? Satan is in full attack mode. How about your church?